Did you know that every Petzl product now has a unique serial number, and the numbers and digits have a meaning? In the early days Petzl’s serial numbers were 4 digits separated by a space e.g. 04 06, this simply told the user the month (April) and then the year (2006) of manufacture. This design was followed by a 6 digit format like the one below (01009A) which gave a little more information to the user, 01 is the year of manufacture (2001)/ 009 is the day of manufacture in that year (9th January) / A is the code of the person who inspected the product. This example shows the serial number (15041OI4974) with the first two numbers (15) corresponds to the year of manufacture I.e. 2015, the next three numbers (041) corresponds to the day of manufacture in that year I.e. the forty first day of 2015 (10 February), the two letters (OI) is the code of the person who inspected the product and the final four numbers (4974) is the individual product number / incrementation. You may find products with the same first five numbers (i.e. have been manufactured on the same date), which have been inspected by the same person (so the first 7 digits will be the same) BUT the complete last four numbers will be different (0001, 0002 etc) and it is this difference that makes the full serial number unique. The first two numbers (16) are the year of manufacture (2016), the single letter (C) is the month of manufacture (March), the next sevens numbers are the batch number, and the final three numbers are the incrementation. And if you are wondering where the serial numbers are hidden on the Petzl Croll and Petzl Basic, check behind the catch! On the Avao harness range the serial number is on a white tab tucked away in a small pocket in the waist belt padding on the right hip. For the new Petzl Newton and Volt harnesses, look for the pocket sewn into the top of the back section of the left leg loop. All new Petzl products are individually serial numbered and this number can also help the user establish the exact age of the item. Depending upon the age of the product, you will find one of a number of varieties of Petzl serial number designs. 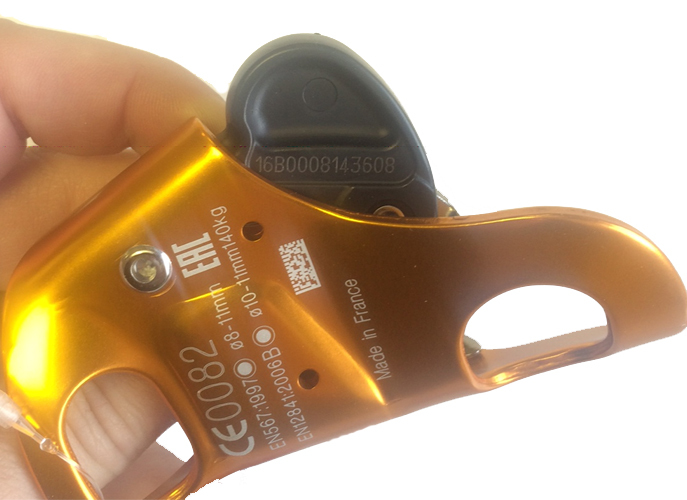 The photo example shows the serial number (15041OI4974) which is taken from one of Petzl’s newer products. The first two numbers (15) corresponds to the year of manufacture I.e. 2015, the next three numbers (041) corresponds to the day of manufacture in that year I.e. the forty first day of 2015 (10 February), the two letters (OI) is the code of the person who inspected the product and the final four numbers (4974) is the individual product number. You will find products with the same first five numbers (i.e. have been manufactured on the same date) and furthermore which have been inspected by the same person (so the first 7 digits will be the same) BUT the complete last four numbers will be different (0001, 0002 etc) and it is this difference that makes the full serial number unique. Oldest Petzl products my be marked with a 6 digit serial number like the one above 01009A. 01 is the year of manufacture (2001)/ 009 is the day of manufacture in that year (9th January) / A is the code of the person who inspected the product. Older products may be marked 05 06, where 05 is the month of manufacture in the year / 06 is the year of manufacture.